Your will receive a warm welcome by our representative on your arrival at the Bandaranaike International Airport. Assistance will be provided with your transfer to your hotel in Negombo. You may relax and unwind after your long haul flight to Colombo. After an early breakfast you will be travelling to the historic town of Polonnaruwa. Enjoy an early lunch by an ancient royal lake at Hotel Diya Dahara. Upon arrival at Habarana village you will be able to immerse yourself in authentic Sri Lankan village culture and food. Optional: Climb Sigiriya Rock Fortress. Windsor Park Agricultural Farm and Resort. After breakfast, take a tour of the Windsor Park farm. Windsor Park prides itself in organic production of food. Walk on the bunds of the paddy fields that feed much of Sri Lanka with rice harvests. Spend time with baby buffalos, sample some buffalo curd, and watch peacocks gliding through banana plantations. Stop for a picnic in a lakeside hut and check out a traditional Sri Lankan farmer’s lunch. After an early breakfast head to Dambulla Wholesale Market. Walk through the hustle and bustle of one of the country’s busiest food markets. Fresh produce of fresh fruit and vegetables are traded here. Merchants gather here to buy produce at wholesale rates for distribution to retails outlets throughout Sri Lanka, feeding the demands of a 25 million population. Travel to Ranweli spice garden for a personal tour of an impressive array of Sri Lankan-grown spices. Take part in a demonstration of the usefulness of traditional spices in Sri Lankan cuisine. After breakfast visit the sacred temple which has housed the tooth relic of the Lord Buddha for generations. Leave Kandy and head towards the tea plantations in Nuwara Eliya. Take a brief stop at the Tea Bush Hotel to enjoy the breathtaking views of the surrounding landscape and take photos. Visit the Bluefield Tea Factory for a personal tour of one of the country’s oldest and most reputed tea plantations. Wake up to a traditional Sri Lankan breakfast prepared by your in-house chef. Check out the scenic town of Ella as you pass through the picturesque town of Nuwara Eliya. Relax before trekking along many tiny lanes off the main street for your cooking class. Watch and learn as you follow a demonstration of a Sri Lankan traditional cookery class with Ella’s best instructor, in a traditional Sri Lankan home environment. After an early breakfast we begin our journey down hill to the coastal town of Galle, on the way stopping briefly to watch the Ravana Falls –the mythical waterfall at the centre of the Ramayana folklore. Optional: Extra day to visit and stay at Yala Safari. Stop for an early lunch at a small wayside street vendor in the hills, and indulge in the much celebrated coconut roti and jackfruit curry. ​After lunch, set off to the Dutch fort town of Galle for lamprais –a Dutch innovation in Sri Lankan cuisine. 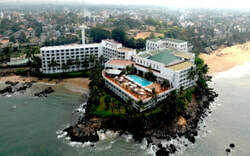 ​Following breakfast, take a tour along the historic Galle Fort. Continue your journey towards Mt Lavinia, stopping to visit the sea turtle conservation centre and have lunch at Bentota Lake. Visit merchants of Sri Lanka’s famed gems. Check into the historic Mt Lavinia Hotel, explore the vast grounds of the former Governor’s mansion and immerse yourself in the romantic history of this expansive home. ​Dine by the beach at the Mt Lavinia fish market, where you will get a chance to pick fresh seafood. Enjoy the legendary breakfast, prepared under the guidance of Sri Lanka’s most celebrated chef, Publis. Following breakfast, listen to an exclusive lecture from Chef Publis himself, including his adaptation of the ancient royal recipes found at the Temple of the Tooth in Kandy. Then, enjoy an unique opportunity to follow a firsthand cooking class with Chef Publis, before joining him for lunch after a practical cookery session. Start your final day with a sumptuous breakfast. Then proceed to Maravilla at dawn to watch Sri Lanka’s fishermen returning ashore with their night's catch. Mingle with the fisherfolk and their families. Join in on singing their songs of ‘hodi-helley-helley-ya’ as they drag their nets to the shore. Today you will check out of Club Palm Resort. You have reached the end of y our tour in Sri Lanka. Your chauffeur will take you to the airport in time for your departure. We hope you had a memorable holiday in Sri Lanka. Have a pleasant flight back home. Thank you for choosing Leisure World Tours services for your holiday in Sri Lanka. Please do recommend us to your friends and family. Cheers! Travel agent reserves the right to make changes to the itinerary in case of unforeseen circumstances or natural disasters.